“It’s funny, my daughter & missus are coming to Chelsea today – I don’t think they’re coming to look at me”, Steve Bruce quipped before Hull’s game on Sunday. Yet the way Bruce has been acting in his interviews and on the touchline, his motives for coming to West London were exactly the same: to get up close and personal with Jose Mourinho. In the dying moments of the first half, with Chelsea leading 2-0 and in control, the Stamford Bridge crowd were also treated to a legitimate example of goal line technology. Branislav Ivanovic’s header was indeed clawed off the line, although replays showed just how close it was. 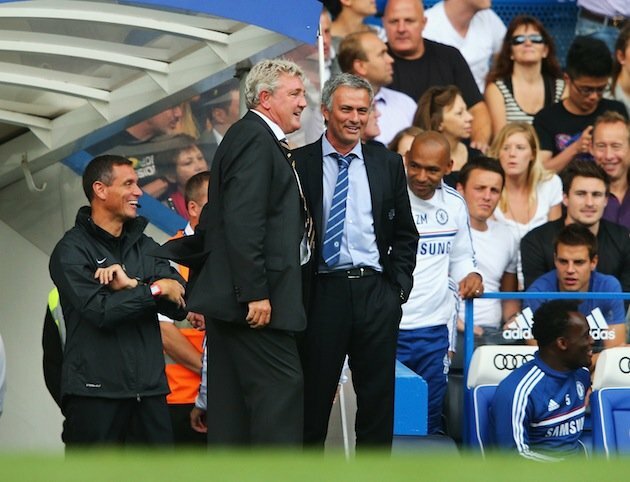 Meanwhile, Bruce strolled over to Mourinho by the dugout, laughing and holding his hands up in mock prayer. Did he actually care or was this just an opportunity for some small talk? Jokes aside, Bruce does appear to have approached this Hull team in a more cultured manner to the sides previously associated with him. Hull were promoted playing three centre-backs and while this tactic may be too bold for the Premier League, it shows a desire to try different systems. A 4-3-3 formation has been fine-tuned during pre-season and if their second half performance against Chelsea is anything to go by, they are definitely capable of causing lesser teams some problems. They completed 503 passes on the day, only 49 less than Chelsea, and matched them with 48% of the possession too. The name Tom Huddlestone is synonymous with the phrase ‘range of passing’ and he is likely to play an integral part in Hull’s survival hopes. He adds a bit of much-needed quality to this Hull side, and playing next to the more mobile Jake Livermore, the pair from Tottenham should be an exciting watch. Goals were a worry for Hull last season in the Championship – they managed to score just 61 despite finishing 2nd. Bruce has taken a punt on Ivorian striker Yannick Sagbo, who has compared the powerful player to Christian Benteke. Former Swansea striker Danny Graham also brings a touch sophistication and work ethic to the team’s frontline, able to press and play in others as well as offer his team an outlet himself. With many of the bottom half clubs making some serious improvements this summer, Bruce will certainly have a difficult task keeping Hull above water in what is shaping up to be a very competitive season. Unsurprisingly, all the attention on Sunday was on Mourinho’s return to the Bridge. Chelsea were the better side, “breathtaking” to watch in Bruce’s words. Yet behind this fanfare were glimpses of a Hull side that can shed their tag as relegation favourites. This entry was posted in Analysis and opinion and tagged chelsea, hull city, jose mourinho, steve bruce by Hugo Greenhalgh. Bookmark the permalink.